In case you don’t know, I’m a choir teacher. Each day, I take my class (made up of 53 crazy, ill-mannered 7th graders) to the cafeteria for lunch. The kids go through the line and get whatever is on the menu for the day. I, however, always bring my own lunch to school, which is almost always leftovers from the previous night’s dinner. There is pretty much never a day when I regret this decision, seeing how the school food is…well…school food. Recently though, the lunch ladies served up some delicious looking and smelling chicken (or was it turkey?) tetrazzini. I didn’t eat any because I had brought my own lunch, but smelling it and hearing all the kids say how AMAZING it tasted (of course they said this while they were chewing huge mouthfuls of it), really made me crave it! So, I sought out a recipe to try. You may or may not know this, but there’s like a bajillion recipes for this stuff online. I picked one that looked simple yet still tasty. And it was a winner! This dish was so creamy and flavorful. And the re-heated leftovers were just as delicious as the night we pulled it out of the oven. I’m very pleased with this recipe, but I do wish I’d had some pimentos or bell peppers to throw in there and give it a little color. It doesn’t look that great in the picture, but trust me, it was awesome! Cook spaghetti according to package directions, adding salt and oil to water. Drain. In large saucepan or Dutch oven over medium heat, melt butter. Add onions and garlic. Cook, stirring occasionally until soft, 2 minutes. Add soup, broth, seasoned salt, and 1 1/2 cups of the cheese. Cook and stir until cheese melts and mixture is smooth. Add spaghetti, chicken, and bell pepper. Mix well. Transfer to 3-quart baking dish. Cover with foil. Bake for 30 minutes or until hot and bubbly. Remove foil. Sprinkle with remaining 1 1/2 cups of cheese. Continue baking 2 minutes or until cheese melts. Sprinkle with parsley. You could use turkey instead of chicken. This is great for using up leftovers! Hahaha I just watched that video. Thanks for sharing it, it gave me a good laugh! 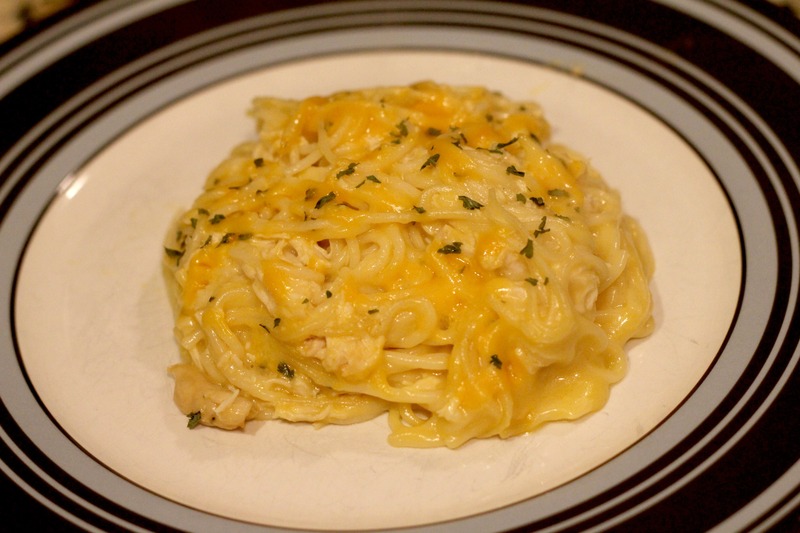 I never thought about a chicken tetrazzini luring my man away, but now I might! This is a wonderful recipe! my mom used to make this! It’s not something we ate a lot growing up, but now I wish it was! It’s so good! Made this last night….it was yummy! Thanks Paula! Glad you liked it! 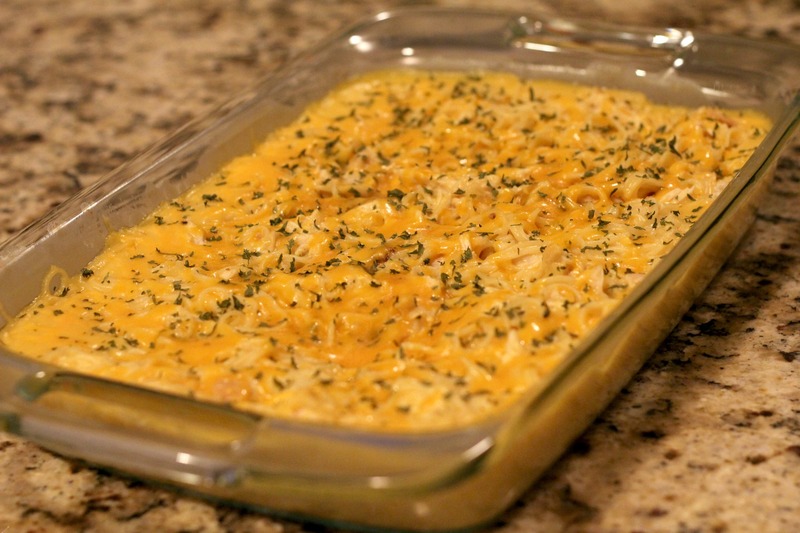 Great recipe…I usually add a cup of chunked ham and it is tasty. Oh I like that idea! I hadn’t thought of ham before! Thanks Michele!